I can't remember ever making homemade mac n cheese. I searched the web in search of the best recipe I could find and came across one with lots of good reviews by Martha Stewart. I was all set to make this one and then yesterday I come across another recipe from the blog of LizzyDishes, a new twitter contact. 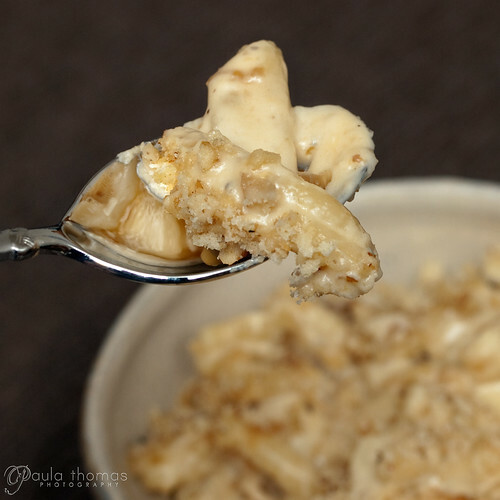 So I ended up making her Walnut Crusted Stilton Mac and Cheese with Caramelized Onions. I don't even want to think about how many calories this thing is, not that I'm worried about my weight. I pretty much stuck to her recipe but made a few minor modifications. For the cheddar cheese I used 8 oz of sharp and 4 oz of medium Tillamook cheddar. I used Strozzapretti for the macaroni. 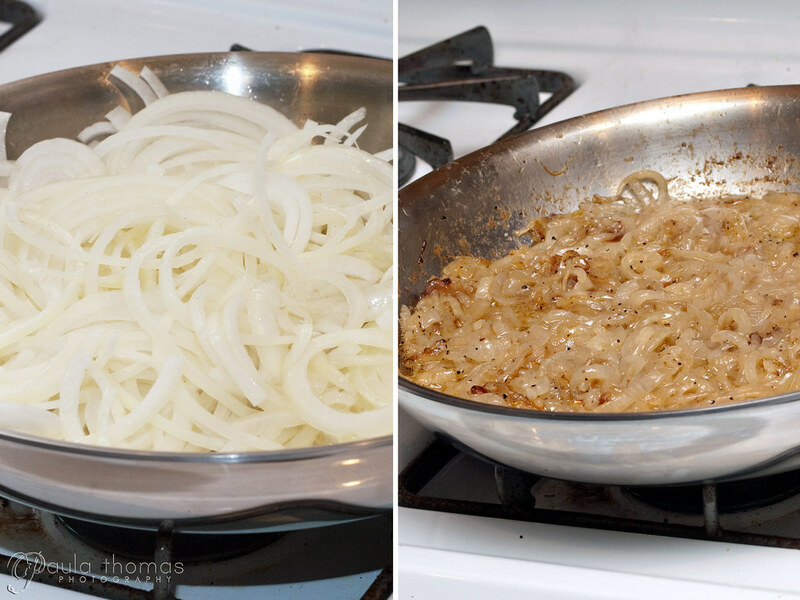 In a sautee pan, melt 1/2 cup of butter and add yellow onions. Season with salt and pepper and sugar and let cook over medium heat, stirring occasionally for 45-50 minutes, until onions are golden brown and are almost the texture of jam or preserves. Set aside. In a large pot, melt the 4 T. of butter. Add flour and mix with butter until it turns to a paste and cook for 2-3 minutes. Very slowly add milk, whisking constantly to avoid getting lumps. When all the milk is added, whisk in the cream and half and half. Add kosher salt and fresh ground pepper to taste. Cook for about 10 minutes, until liquid is thickened and simmering. 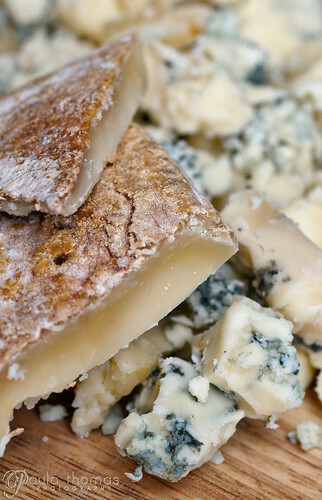 Turn the heat off and add the cheese, whisking until cheese is melted. In a separate pot, heat water for pasta. When water is at a rolling boil, add a handful of kosher salt and the pasta. Cook for 6 minutes, then drain (but do not rinse) - the pasta won't be cooked all the way, but it will finish cooking in the oven. Add the pasta to the cheese sauce. Stir in the caramelized onions. 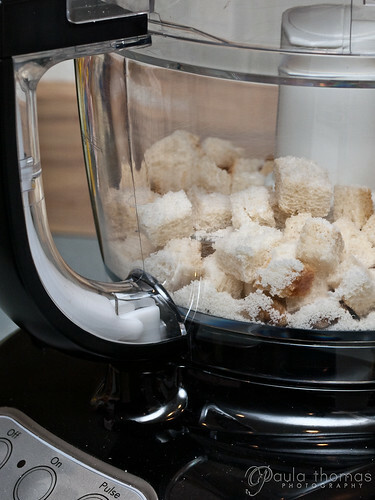 In the food processor, add the breadcrumbs, walnuts, Romano cheese and salt and pepper. Pulse one or two times until blended, but still chunky. 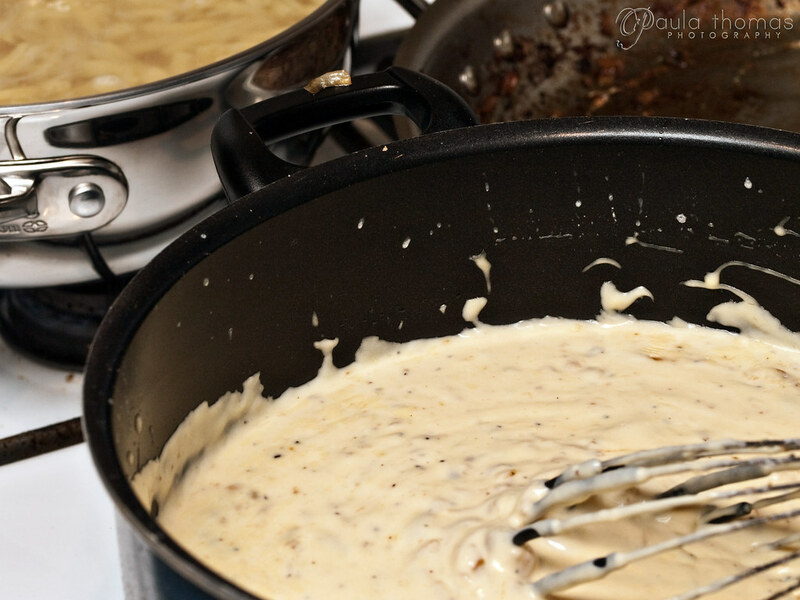 Pour pasta and cheese sauce into a 9 x 11 pan. Sprinkle the walnut mixture over the top, as much or as little as you wish. Bake for 25 minutes at 350 degrees. Let sit for 10 minutes before serving. EDIT: So I was told I forgot to mention in my post if it was any good. I guess I thought the pictures spoke for themselves. It tasted as good as it looked. Delicious! I couldn't eat too much though, it was very filling! I have tons leftover. Will be packing it for lunch at work for the rest of the week. So glad it turned out! Your photos are amazing.